On November 9, 1957 Elvis Presley arrived in Hawaii for the first of what would turn out to be many occasions. He was clearly very happy with what he found, as he returned to Hawaii again and again – for movies (Blue Hawaii in 1961, Girls Girls Girls in 1962 and Paradise, Hawaiian Style in 1965), for concerts (including the first-ever concert to a worldwide audience) and for personal holidays. During those trips Elvis visited a number of locations that are today considered iconic Hawaiian landmarks – so follow in his footsteps and let the King be your guide on a tour of one of Hawaii’s most beautiful islands. Aloha from Oahu! 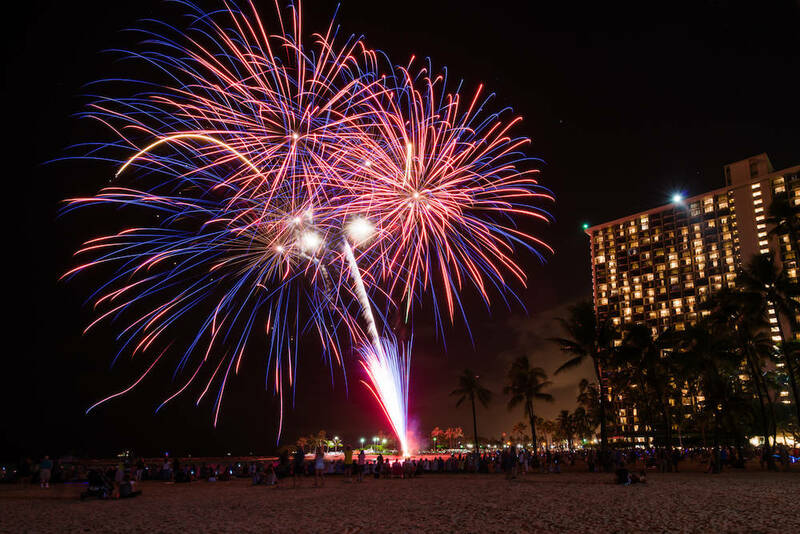 Hilton Hawaiian Village: This landmark hotel in the heart of Waikiki has undergone a few renovations since it was visited by Elvis, but it’s still renowned for its famous Friday tradition – a fireworks show over Waikiki Beach once the sun goes down. The Elvis Connection: Elvis held several press conferences here and stayed at the hotel on a number of occasions. His first visit was in 1957 when he was in Oahu to perform a couple of concerts at the Honolulu Stadium. Back then, he stayed in room 14A in the Ocean Tower (known as the Ali’i Tower these days). It was also his base in Hawaii while he was filming Girls, Girls, Girls in 1962, and another time he booked out the entire top floor of the Rainbow Tower. You can even see the hotel in the helicopter arrival footage from the “Aloha from Hawaii” concert. 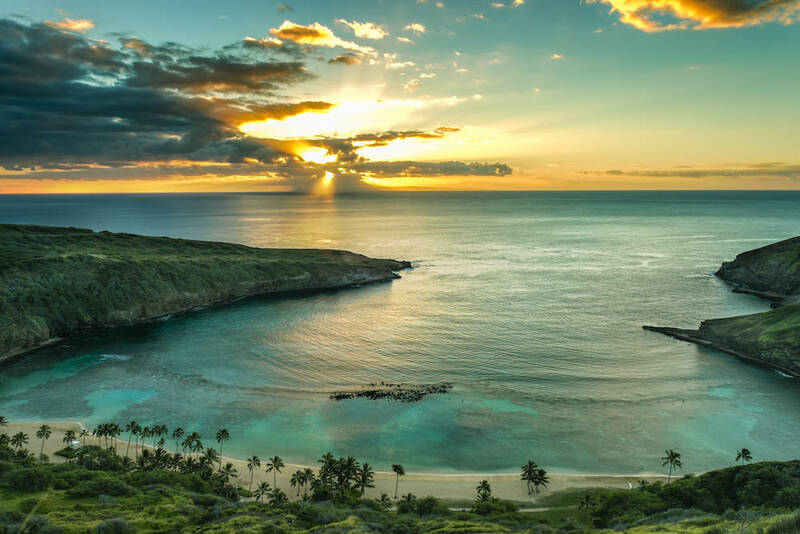 Hanauma Bay Nature Reserve: The fact that this bay’s full name is Hanauma Bay Nature Reserve tells you that this is somewhere special. Not only is it a truly glorious beach (its white sands and turquoise waters look pretty much the same as they did 57 years ago when Elvis filmed here), it’s also now a protected reserve, with a coral reef, loads of marine life and amazing snorkelling. The Elvis Connection: A number of the beach scenes in Blue Hawaii were filmed at Hanauma Bay. The shack where Chad (Elvis’s character) and Maile (his love interest, played by Joan Blackman) changed into their swimsuits is no longer there, but you can still snorkel in this beautiful bay. Indeed, the Obamas did just that when they holidayed here in 2015. FYI, Elvis returned to Hanauma Bay in 1965 when he filmed the helicopter rescue scene for Paradise, Hawaiian Style. 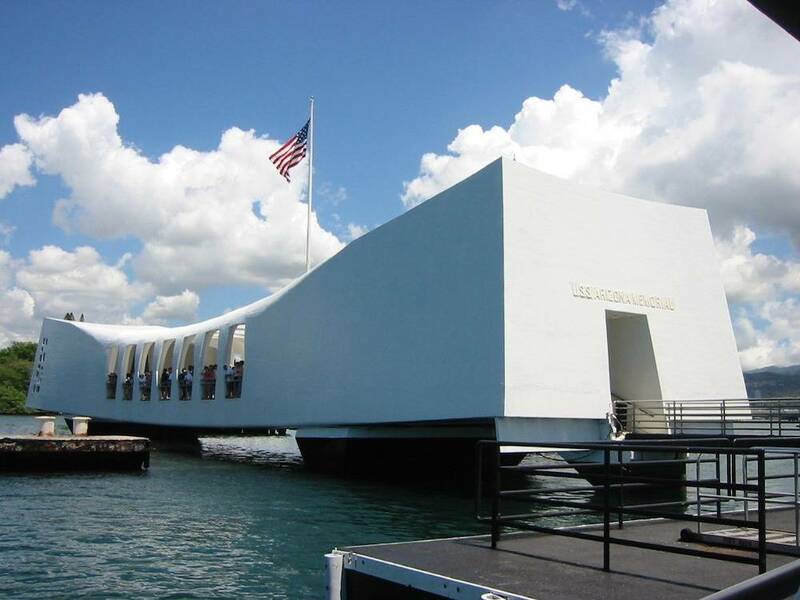 Pearl Harbor: Oahu has many world-class attractions, but the most sobering is undoubtedly the historic Pearl Harbor Naval Base, located just outside of downtown Honolulu. It was here, in the early morning of December 7, 1941 that Japan launched a fatal bombing attack, killing or wounding more than 3,500 Americans. It was because of this attack that the United States officially entered World War II, declaring war on Japan and Germany a few days later. A visit to Pearl Harbor Historic Sites – including the USS Arizona Memorial, the Pacific Aviation Museum, the USS Missouri and the USS Bowfin submarine – is a must for visitors to Oahu. The Elvis Connection: Elvis gave a benefit concert in Pearl Harbor’s Bloch Arena on March 25, 1961, to help raise funds for the USS Arizona Memorial, one of eight battleships that were sunk or damaged in the attack. He performed (along with other artists) before 4,000 people, raising more than $64,000. The amount seems laughable in today’s terms (a fund raiser for Pearl Harbor, starring Elvis?! How did it not raise a gazillion dollars?! ), but it represented more than 10% of the final cost. Years later, while he was filming Paradise, Hawaiian Style, Elvis came back to visit the memorial and pay his respects to those who lost their lives. Polynesian Cultural Center: Head to the Polynesian Cultural Center on Oahu’s northeast coast if you want to experience an authentic Hawaiian luau – a night of culture with hula dance, chanting and traditional cuisine. The Center is a living outdoor museum, showcasing six different Pacific cultures across 17 hectares. The Elvis Connection: This was one of the main locations used during filming of Paradise, Hawaiian Style and a few different sites were featured, including a famous palm tree, a canal down which Elvis canoed during the song ‘Drums of the Island’ and a huge waterfall set used in the film’s Festival finale. There’s also a hut that Elvis used as a changing room during filming! Neal S. Blaisdell Center Arena: Originally called the Honolulu International Center Arena, the Neal S. Blaisdell Center Arena was renamed after the mayor of Honolulu who oversaw its construction. Metallica, Van Halen, Bon Jovi, Elton John, Santana and Bruno Mars have all played at this circular venue. Elvis Presley made his gift the world’s. The Dole Pineapple Plantation: Located in the centre of Oahu, this plantation was founded by James Dole (a.k.a the “Pineapple King”) in 1901, while the tourist-attraction part of it was established in 1950 as a small fruit stand. It’s grown and grown over the years, and these days is one of Hawaii’s top attractions, attracting about a million people every year. They come to have a crack at one of the largest mazes in the world (shaped like a pineapple, obviously) and taste all sorts of pineapple delicacies, including the famous ‘Dole Whip’ (soft serve pineapple ice cream). The Elvis Connection: In Blue Hawaii, Elvis’s character, Chad Gates, doesn’t want to go in to the family business (pineapples), but does take some guests (girls, natch) on a guided tour of Oahu island, stopping at a pineapple plantation. It’s not actually identified in the film, but the Dole Pineapple Plantation seems like a pretty good guess! • Honolulu airport (but it looks pretty different these days!). • Diamond Head (the mountain overlooking Waikiki featured prominently as a backdrop in many scenes in Blue Hawaii. • Take one of Smith’s famous Wailua River cruises to visit the fern grotto that featured in Blue Hawaii. • AlaMoana Park – a public park and stretch of sandy beach between Waikiki and downtown Honolulu which featured in Blue Hawaii. • At one end of AlaMoana Park is the Kewalo Basin; at the other is the AlaWai Yacht Harbor – both featured in Girls, Girls, Girls. • The Ilikai Hotel (adjacent to the Hilton). Elvis stayed here while filming Paradise, Hawaiian Style in 1965 and also while on holiday in 1968 and 1969. He would dine frequently in the restaurant at the very top of the hotel. Back then it was called The Top Of The I, but these days goes by the name Sarenta. • Lanikai beach – Elvis rented a private home here (where Barrack Obama also stayed on a recent holiday) during his last vacation in Hawaii, in March of 1977.